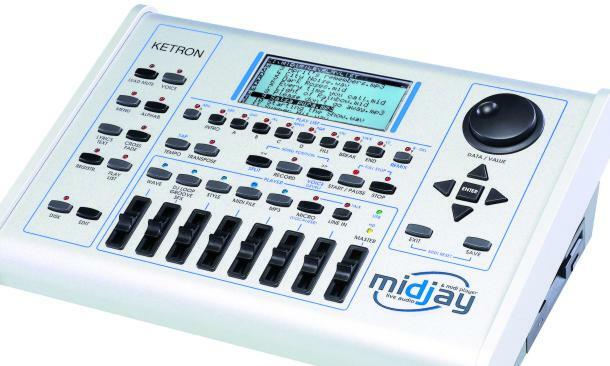 Ketron's Midjay is designed to be a perfect show machine for the contemporary DJ and live entertainer. Midjay incorporates a 20G hard disk, USB, MIDI, wave and Mp3 player capabilities. It provides hard disk recording, video interface, floppy disk drive, a large high resolution LCD display, stereo line input, microphone and optional vocalizer. The machine is fitted also with a hi-quality sound generator, with punchy drum sets, special effects and realistic instrumental voices. An alpha dial plus eight sliders for separate volume control and specialized fast access tabs have been added to ensure the easiest live performance control for Midi, Wave and Mp3 files. A sophisticated automatic crossfade function allows blending from one file to the next, regardless of which audio file is playing. The MidJay also comes with an extensive MIDI file editor, which incorporates the possibility to change parameters, sounds and controls for each track. Files can be addressed numerically or alphabetically or can be directly scrolled through. The user can also easily associate and synchronize lyrics or text files with MIDI files, waves and Mp3s. The Microphone section comprises preamp, gain, filter, effects and can be used to record directly to the hard disk. In summer 2006 software version 4.0 was released providing extra features such as new Midifile-playmodes, a footswitch option for starting harddisk recording, additional USB functionality, zoom for display and monitor, DJ-Loop, and Groove-Remix. Software 4.0 also offers control features via Ketron's keyboard SD5.